The members of the Regional Leaders Summit are seven key regions across the world, and their strengths extend to science. There are areas where the seven members share existing competencies and excellence in science and innovation. In order to leverage the RLS network, RLS-Sciences designated four thematic areas with the greatest potential for cooperation. Based on these themes, there are four multilateral research projects underway. Each project operates independently of the other, while under the RLS-Sciences framework. 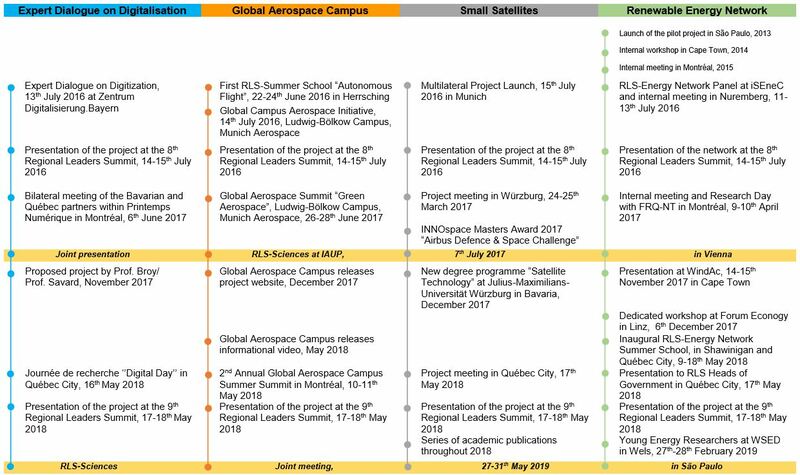 The projects are: the RLS-Expert Dialogue on Digitization, the RLS-Global Aerospace Campus, RLS-Small Satellites, and the RLS-Energy Network.